Nothing gets the blood pumping like a possible Finals preview. Right about the time MVP candidate/scoring leader/International Swag Champ James Harden got tangled up with LeBron James, tumbled to the floor, and unleashed a tepid Blanka kick (hold control pad down + B) aimed at the King’s royal Ohio nads, I realized that I absolutely love rooting against this Rockets team. They are so good, so skilled, and so smart. They are worthy villains. In sports, there is no higher compliment. I would love to see them make the Finals. I’d want them to lose in the Finals, but still. What made Sunday’s Rockets-Cavs game compelling, beyond the individual matchup of Harden versus James, was that we were seeing two very good teams at completely different stages in their respective evolutions. At this point in the season, the Rockets are a machine that produces 3s, layups, and free throws at unapologetically high rates. That’s their identity. They have a panoply of long, mobile harassers in Corey Brewer, Trevor Ariza, and the recently returned to health Terrence Jones. Depth plus identity has allowed the team to keep pumping out wins in the absence of human bag-o’-candy Dwight Howard and the elite rim protection he provides. Howard hasn’t played since January 23, and in that time the team is posting a 3.4 NetRtg, slightly down from its season NetRtg of 3.8, but still good for top 10 in the league. The Cavs have been tearing apart the league since Chuck E. Blatt’s surprise L.A. bowling trip, but questions remain. Questions such as this one posed by Kyrie Irving: “Is this, like, similar to what the playoffs are like?” I’m sure the same query has been knocking around inside the skulls of Kevin Love, Tristan Thompson, and Matthew Dellavedova; Cleveland’s game against Houston was the most acutely competitive NBA game those dudes have ever been a part of. Cleveland, which was without its starting point guard Sunday, is not built to weather the loss of Irving’s handles in the way the Rockets can keep on keeping on without Howard. Delly is a gamer, but he’s overmatched athletically, as evidenced by his holding on to Andre Iguodala’s rear bumper for dear life two games before the Houston tilt. Iman Shumpert will D-up but he can’t handle the rock, while J.R. Smith can handle it but under most circumstances absolutely should not. The Cavs’ identity right now, the thing they know for sure they can count on, is this: LeBron is, like, really, really good. So, what did we learn from watching a polished Rockets team go up against a Cavs team that’s still figuring it out? Let’s take a look at the two major players, through the lens of a game I call Swag Champ, Fuckboi, Title Contender. LeBron scored 37 points, on an uncharacteristic 35 shots, to go along with eight rebounds, four assists, and three blocks. Patrick Beverley tried to take a charge, and James did the Blake Griffin “fall on top of you accidentally-on-purpose then get back up by putting my hand on your chest” move. … and on another, he made it look like two guys trying to square dance (more on this in a bit). He missed the two free throws that would’ve sent the game into double overtime and went 3-of-11 from the line overall. This was The James Harden Experience. Thirty-three points, 15-of-18 from the line, eight rebounds, and five assists. I don’t know if there’s ever been a player more tailor-made for a team’s system. Harden was born to play Moreyball. Say what you want about his occasional penchant for head-snapping quasi-flops, but the guy legitimately draws contact. It’s just quite often, and it seems like that’s all he wants to do. Harden is sneakily strong; for the dozens of times a game he snakes into the paint gripping the rock, vise-like, and swinging his ref-baiting arms into thickets of defenders, you very rarely see him get stripped. He’s the Rockets’ engine, steering wheel, and transaxle. 1. The Cavs made a very rational decision regarding Harden: Since the dude is drawing fouls anyway, maybe foul him really hard. Timofey Mozgov got a nice wrestling heel two-handed face rake on him, which led to various Rockets stepping to Mozgov, which led to the wondrous sight of Mozgov talking a bunch of trash that was likely understood by no one. 2. Harden, whose game is heavily predicated on getting fouled, didn’t seem to like getting really fouled, which led to the aforementioned self-defense class keeeeee-yaaaaa to LeBron’s crotch region. 3. In a truly hilarious sequence late in OT, Harden drove by James, releasing his ref-trawl arm behind him. That arm, as planned, became entangled with James’s arm. The two MVP candidates then staggered around like a couple of bucks whose racks have become interlocked during a territorial joust over a blackberry bush and a fertile doe. The refs simply refused to call a foul. This is Houston’s nightmare scenario — that the let-’em-play playoff doctrine will bring less low-hanging whistles. This is what appeared to happen last postseason, when the Rockets suffered a first-round loss to the Blazers in six games. Portland scored 670 points in that series and the Rockets scored 672. 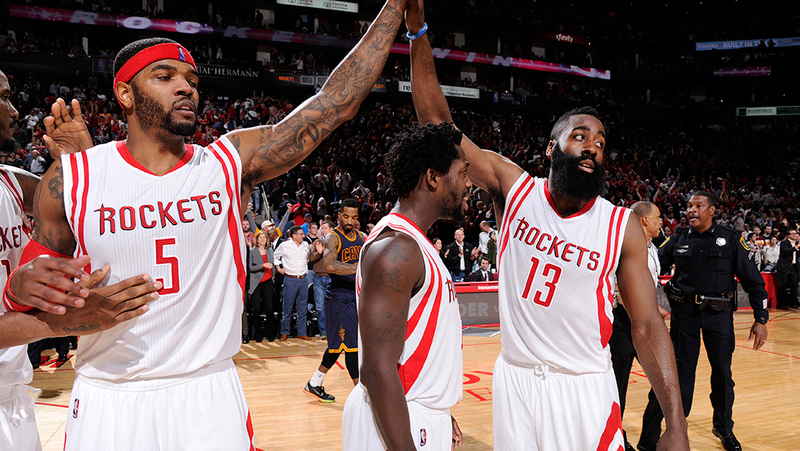 Houston’s 2013-14 regular-season free throw rate1 was .386, which dropped to .325 against Portland. That equaled about one fewer free throw attempt per game. So, the Rockets are screwed. Most playoff teams saw their free throw rate increase last postseason, with only the Rockets, Clippers, and Mavericks seeing their free throw rate drop. Dallas’s free throw rate dropped from .253 in the regular season to .217 in the playoffs. BUT! The Mavericks played the Spurs, who are experts at defending without fouling, and who were tied with the Charlotte for the fewest personal fouls per game in the regular season. Similarly, the Blazers only gave out 19.2 fouls per game during the 2013-14 season, sixth-lowest in the league. In other words, free throws are probably just like everything else in the playoffs — beholden to matchups. Free throw attempts/Field goal attempts.